Office spaces are just one of many places that people do not often think of when they think of places that might need to purchase signage, but having engaging and approachable signage in an office is just as important as having the same in a retail setting. There are still potential customers or clients entering the space, and you want them to feel at home and welcomed in that space so that they return, or recommend to others that they use your services. The purpose of business signage is to engage customers in what services or products you offer, either to give them information about your business (whether it is first contact information, or some new information about changes or promotions going on), or to create a positive association with you. While it is easy to imagine that this is simply applied to, say, a clothing company (a sign might show a new style of shirt, or tell potential customers about a sale), it takes a moment longer to imagine what good, approachable signage in an office setting might look like. Imagine for a moment that you are a psychologist or a family lawyer. You would be operating out of an office setting. The people who are your prospective clients are probably not in the best state, or having the best time of their lives. They might feel a little bit fragile, or nervous about visiting you, given the kinds of cases you take on (psychological trauma or divorce cases). For your business to continue to operate smoothly, you need a constant influx of new or repeat clients. For clients to want to return to your office, or to recommend you to other people, they will have to feel that you created a safe, welcoming environment for them in their difficult time. You can do this by investing in well-designed, easy to use office signage. 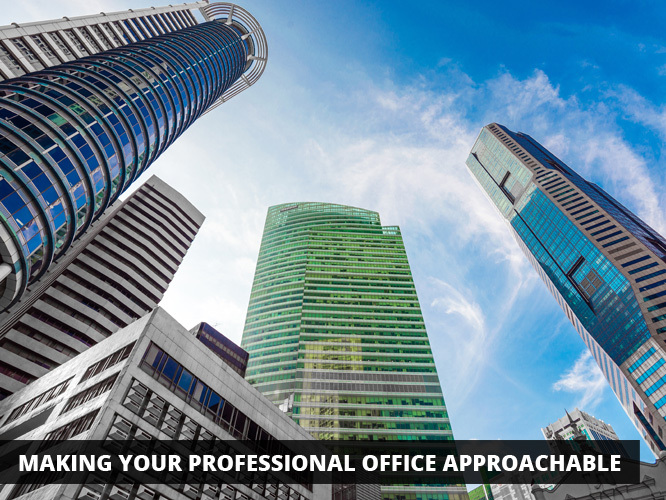 Clients coming in will need to be able to find your office space, and then possibly follow other directions once they have arrived. To create a safe, welcoming environment, it will help immeasurably to have signage that makes it clear where clients need to go, what they need to do, in a manner that is not confrontational. This can be done through clear signage that puts the principles of graphic design to use to create a positive association with the space of your office. Calming colors and patterns might be used so that clients are made to feel welcome, and large letters so that clients are not confused about where to go will help them feel better about their experience with your office. The sign industry has more depth and breadth than most imagine, which is why it is a wonderful industry to become involved in. A great way to get a start in the sign industry to take advantage of the various yet-unexplored opportunities in sign sales is to open a Sign World franchise. We help you get going with all of the tools and knowledge to make the most of your experience in this exciting industry. Once you are set up with your franchise, you are still constantly supported with always updated training and information to help you grow so that your franchise makes the most of every aspect of the sign industry. With an industry like this, it is best to have the support of a vast and knowledgeable team to make sure that you are aware of all of the potential areas of business expansion. Trying to make it in the sign industry without the support of a community like the Sign World team might be difficult, given how many options there are in signage. If you have the entrepreneurial spirit and are ready to embark on a new business journey, Sign World might be the perfect fit for you!